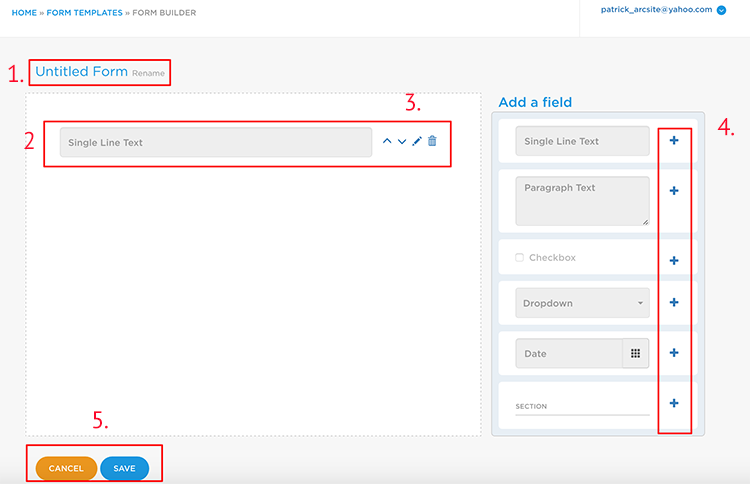 From the user site (https://user.arcsiteapp.com), you can create form templates that will be accessible from the app automatically. From the subsequent screen you can either create a new form template or edit an existing form template. Edit Options on the Create Form Template button on https://user.arcsiteapp.com/#/forms. Add a new label by tapping on left side of added form elements. In much the same way as you create a new form template ( described in section above), you can also tap on an existing form to edit and change. Once a form template has been created, it will be immediately available from the app. The drawing for which a Form has been filled put must be upload to the ArcSite Cloud Account and then can the Form (and Drawing) can be downloaded from there.